Winnie-the-Pooh and Baby Monkeys, Too! What does this 4-minute video tell you about this child’s experience of children’s books? She offers an inventive retelling of A. A. Milne‘s The House at Pooh Corner, starring Winnie-the-Pooh, Tigger, and… baby monkeys. I posed this question to all three of my classes as the first electronic message board post of the term. Here’s my answer. The petite fille is an enthusiastic and inventive narrator, launching the tale with Pooh and Tigger discovering the baby monkeys’ absence. As in a fairy tale, her narrative’s emphasis is on plot. Lots of things happen, usually with little regard for setting or the psychology of the characters involved. There’s a breathless “And then…” quality to her storytelling. Lost in the trees, the baby monkeys see bats, crocodiles, hippopotami, giraffes. They (the monkeys, presumably) “had taken a very long trip. They did not even take the train.” They meet “frightening trees,” “monsters,” and “ghosts.” Later on, the story introduces a witch, the rare clawed mammoth, and even a journey to heaven. She does her best to keep the tale full of incident. The tale’s elements of social realism certainly recall the fairy tale more than Milne’s work. They encounter “boxes with animals who are poor” and “without anything to eat.” These boxed animals are not only hungry and lost, but fleeing a social order that would like to see them “put in jail.” The narrative here evinces an awareness of the indifference with which an allegedly civilized society treats its most vulnerable citizens. Belying the stereotype that children are unsuited for “grown-up” themes, this child shares her concern not only for the poor but for a suicidal hippo — who, belatedly, regrets his death wish. 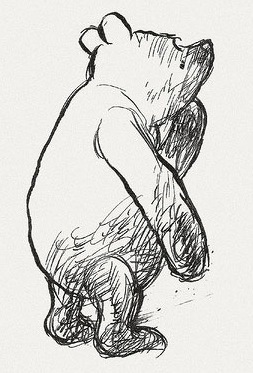 Often, Pooh and Tigger find themselves relegated to secondary characters instead of the starring role they are used to. In the second minute of the story, Tigger jumps into the trees, and recovers the lost monkeys. Then, he and Pooh head off “into the woods to find some strawberries,” but a witch intervenes — sending the narrative back towards fairy tales once more. The witch claims ownership of the strawberries, resulting in a fight. A helmet-clad king lion — bearing both sword and shield — rescues them, and Pooh and Tigger again slide back into the role of supporting players. Our young narrator’s sense of audience is key. She not only responds to the woman’s (her mother’s?) prompting, but even brings her into the story: “There was a lady who had a ring like yours but different,” she reports. (The difference? It’s orange.) Enabling a happy ending, this orange ring is also magic, able to kill witches and set the people free. Incidentally, I deliberately framed the question as “this child” rather than as “children”: I don’t want to suggest that this child speaks for all children. Though people are fond of making such statements (“children will love this!” etc. ), they’re impossible to support — unless you survey a large group of children, of course, but the sort of person given to such proclamations rarely does. Rather, I find this video interesting for what it tells us about one child’s experience of story. She’s focused on narrative, audience, and discusses subjects that might give some grown-ups pause. The entire performance resembles a fairy tale as told by Edward Lear. Sure, we’re missing the Quangle Wangle. But that’s OK. We’ve got nonsense, magic, and baby monkeys! As a fan of children’s literature, the French language, and the imagination of the young…I LOVE THIS!